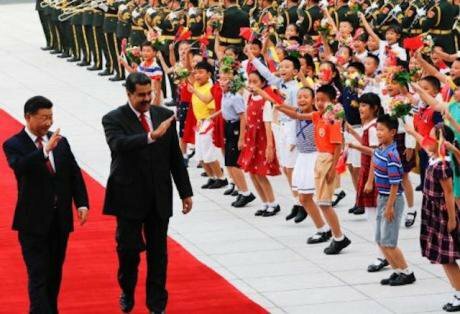 Nicolás Maduro and Xi Jinping during the visit of the Venezuelan President to Beijing on September 15, 2015. Photo: @NicolasMaduro, some rights reserved. Two weeks ago the Secretary General of the Organization of American States, Luis Almagro, surprised the world with his candid remarks on the possibility of a military intervention to stop the ongoing humanitarian and political crisis in Venezuela. Speaking from the Colombian city of Cucuta, located at the border with Venezuela, the Secretary General stated: “With respect to a military intervention to overthrow Nicolas Maduro’s regime, I don’t think any option should be ruled out.” He later clarified that he was not referring to armed attacks, aggression, or illegitimate interventions, but only actions in accordance with the principles of international law. A year ago, democraciaAbierta’s author Matt Ferchen, an Associate Professor at the Tsinguah University in Beijing, published an insightful analysis of the Venezuelan crisis titled “Can China help fix Venezuela?”. Amidst a political and financial crisis that has resulted in massive migrations of Venezuelans throughout the Americas – the kind of migration that in the past has prompted military interventions elsewhere, such as Vietnam’s invasion of Cambodia in 1978 – Ferchen tried to flag the importance of a player that is usually neglected when discussing the problem of Venezuela: China. During the last years China has provided Venezuela with over $60 billion in oil-backed loans, and tens of billions more in other investment deals. Indeed, during the last years China has provided Venezuela with over $60 billion in oil-backed loans, and tens of billions more in other investment deals, the latest of which were secured by Nicolás Maduro during his last visit to Beijing on September 15th, on the very same day Secretary General Almagro was delivering his warning to the Venezuelan authorities. Ferchen concludes that “Chinese lending has saddled Venezuela with unsustainable debt and oil export burdens.” What will happen if, and when, Venezuela can’t fulfill its financial commitments with China? 116 years ago, in 1902, Venezuela found itself in a similar plight. Outstanding debts with the British and the German Empires led these two colossi to implement a naval blockade of the Caribbean country. The only thing that stood in the way of the European landing forces and the coasts of Venezuela was the adamant opposition of the United States Government, at the time led by Theodore Roosevelt. Today, even if Venezuela went into default, the scenario described would be hardly possible. Not only has this sort of gunboat diplomacy been abandoned after the criminalization of aggressive war during the 20th century, but the U.S. has also completely deserted its role as the leader of the Western Hemisphere it paid so dearly to build for the last 200 years, President Obama’s maneuver to reestablish relations with Cuba being but an Indian Summer. For the past decades China has secured several strategic beachheads throughout the Americas. Consequently, for the past decades China has secured several strategic beachheads throughout the Americas, including among others, in Nicaragua where a new canal is being built to put an end to over a century of American hegemony over the passage between the Atlantic and the Pacific; in Chile and Peru, where Chinese presence in the mining industry is spreading fast; and, of course, in Venezuela, with the loans-for-oil policy that has kept a dying regime breathing for a few more years. This growing presence in the Western Hemisphere is but a chapter of the Chinese long-term plan for global hegemony, in addition to widespread investment in the African continent, and to the ambitious “One Belt One Road” plan to control international trade routes between Asia and Europe. The possibility of China intervening militarily in Venezuela as its creditor seems at present far-fetched. Further, any military option must be scrutinized with the utmost care on account of the prohibition of the use of force that is enshrined under article 2(4) of the UN Charter. What was of old known as a “humanitarian intervention” today has been refurbished by the international community as the doctrine of the “responsibility to protect” (Both notions are ultimately tributaries of the Just War tradition, which sets forth certain criteria that must be met before resorting to armed force: just cause, legitimate authority, right intention, last resort, and proportionality). Applying these criteria to Venezuela, we obtain that several of them are not met as yet. To be sure, the situation is dire, and crimes against humanity have been committed by the Venezuelan government, as denounced recently by the OAS. This already amounts to a just cause according to international standards. Yet, the other criteria seem shaky at best. Even with Almagro’s vocal opposition to Maduro’s regime, it would be rush to conclude that the OAS – or any other international organization for that matter – has given its consent as a legitimate authority for the use of military force in Venezuela. Further, a right intention can be only ascertained ex post facto. The situation is dire, and crimes against humanity have been committed by the Venezuelan government. This already amounts to a just cause according to international standards. Yet, the other criteria seem shaky at best. The most problematic requirements are those of last resort and proportionality, and both have to do with China’s clout over Maduro. In terms of proportionality, the costs of intervening militarily in a country that is an ally of China without the latter’s consent could prove catastrophic in the long-term, and largely exceed the benefits that could be reaped. Regarding last resort, there is still a possibility that China’s financial might could influence its debtor into implementing the necessary reforms to stop the political turmoil in the country and the migration crisis in the region. At the end of the day, the solution to the crisis in Venezuela lies with China. Just as Russia could – but apparently won’t – exert the necessary pressure for the Assad regime to stop the bloodshed in Syria, the key to ending the humanitarian and political crisis in Venezuela is held by the Chinese. Thus, Ferchen concludes that “Beijing, in short, must make a more responsible approach to its relations with Caracas,” as one of the first tests China has to face to earn the title of a true world leader. A good first step would be to cut Maduro off until he gives real guarantees, not only of financial soundness, but of good governance as well. Just as the 1902 crisis went down in history as one of the moments when U.S. hegemony in the Western Hemisphere was put to the test and triumphed, the 2018 Venezuelan crisis could prove a valuable opportunity for China to define the kind of world leadership it wants to conduct in the 21st century.